Okay guys [takes a deep breath] lets do this. I spent a long time thinking about what I wanted my first real post to be. Did I want to share my favorite chocolate chip cookie recipe? Did I want to make cupcakes? Did I want to make something really fancy like a souffle (secret: they’re actually not) to woo everyone over? I decided against all of those. Summer is my favorite time of year for baking. A lot of people disagree because of the hot oven situation. And although I totally feel that (because really, who wants to be sweating as they’re making cookies?) some of the best ingredients are available in the summertime. I’m a fruit kind of girl. Chocolate and peanut butter and hazelnuts and peppermint are delicious and all, but fruity desserts are my favorites. Especially if those desserts involve berries. And pie dough. They are little individual packets of deliciousness. And you get one all for yourself. I have nightmares about soggy, sorry bottom crusts drowning under a soupy pie filling. Not here, oh no. Here you have flaky, delicious crust wrapped around a manageable, non-oozing filling. Plus, there is so much of it. And who doesn’t like crust? (If you don’t, I’m judging you). Great for outdoorsy activities or picnics. Or just munching when you sneak an extra one down to your room. 4) They’re just really yummy. These hand pies in particular are really good. Fruity, slightly tart berries nestled up close to a sweet-but-not-cloyingly-sweet pillow of white chocolate cream cheese mixture, all wrapped up in a super flaky crust. I know a lot of people have beef with white chocolate, but just listen to me for a minute: white chocolate is delicious when you don’t think of it as chocolate. Here it provides a sweetness that isn’t particularly present in the rest of the pie, as well as it enhances the berry flavor. Speaking of berries, I used a mixture of strawberries and raspberries, but I think you could go all-strawberry or all-raspberry. Blueberries might be too sweet. I cooked them down so they don’t drip down your elbow, ruining said portable-ness listed above. Alright, I’m going to shut up now and just let you make these. 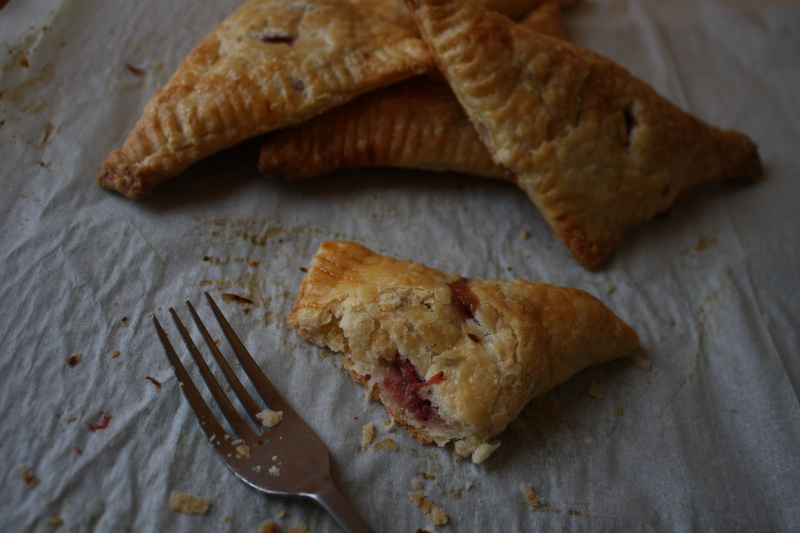 These hand pies are fun treats that aren’t terribly sweet. The filling has a bright, slightly tart berry flavor contrasted with a silky, sweet white chocolate cream. They have a high proportion of crust to filling, so these are definitely for crust lovers. You can use any berry really, as long as they’re not too sweet. I know it seems intimidating, but it’s really important to make your own pie dough with these. You can really taste the difference. Whisk together the flour, lemon zest, sugar, and salt. Add the butter and, using a pasty blender, two knives, or your hands, cut the butter into the flour mixture. Work it in until the largest pieces of butter are about the size of peas. Don’t overwork it or your dough will be tough. Remember: pieces of butter= flaky dough! Add the 3/4 cup of buttermilk and, using your hands, knead it into the dough. If the dough is still too dry to come together, add the rest of the buttermilk, tablespoon by tablespoon, until it forms into a ball. Divide dough into two equal portions and wrap them each in plastic wrap, forming discs. Let sit in the refrigerator for at least 1 hour and up to 2 days. You can also freeze the dough at this point. Just let sit in the refrigerator overnight to defrost before you use it. Wash and dry your berries. If using strawberries, hull and half/quarter them, depending on size. Add berries to a small-medium sized saucepan with the sugar and vanilla and stir to combine. Cover pan and cook over medium-low heat for 15 minutes (you don’t need to stir). Uncover pan and let berries cook until they have broken down and enough water has evaporated that you can drag a spoon along the bottom of your pan and can see a trench form and slowly disappear. Pour berries out and onto a plate, and put in freezer or fridge to cool quickly. Keep cool until ready to use. Gently melt the white chocolate over a double boiler. Take the melted chocolate off the heat and add the cream cheese. Whisk to combine. Whisk in the egg and the vanilla extract. Stick in the fridge until ready to use. Preheat your oven to 400 degrees. Line two baking sheets with parchment paper, set aside. Beat together your egg and water to make an egg wash.
FLOUR YOUR WORKSPACE. Seriously. Do it. Roll out your dough**, careful that it doesn’t stick to the counter, until it is 1/8 inch thick. 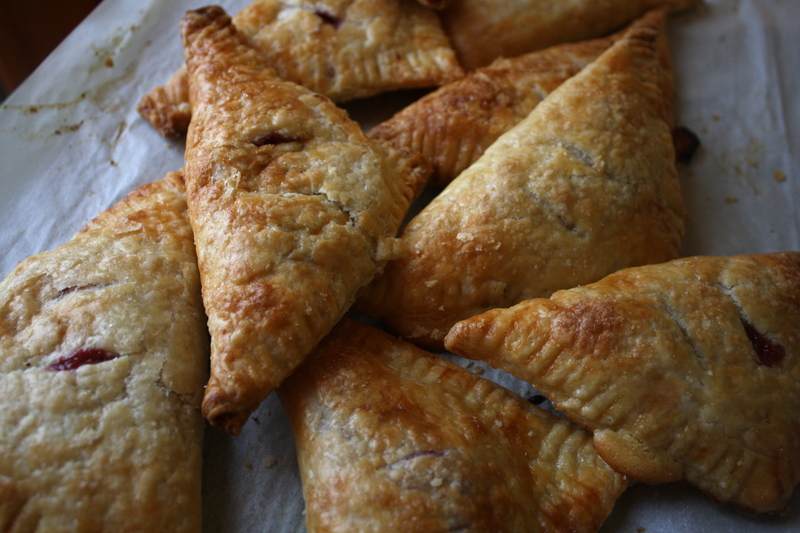 Divide dough into approximately 6 squares, roughly 5×5 each (you can choose if you want to make your hand pies bigger or smaller at this point). Repeat with the second disk of dough. Using your fingers or a pastry brush, coat the edges of the squares lightly with egg wash. For each square, place a small dollop (about 1 teaspoon) of the cream cheese mixture, and 1 dollop of the berries on top of that, all slightly off-center. Bring together opposite corners of the square to form a triangle. Crimp edges with a fork to seal, and then transfer to your baking sheet. Brush the top of each hand pie with the remaining egg wash, and cut a couple of air vents in the top of each. Bake for 15-20 minutes, until crust is golden and puffed. Try to wait long enough to let them cool to room temperature before eating. Might I say…FINALLY! This is so freakin cute I can’t handle it! Cant wait to see whats to come!